Home Ford-Mercury Fairlane 1963-71 1967 Mustang, Cougar, Fairlane Tubular Lower Control Arm part # TBF-6 sold as a pair. Home Ford-Mercury Ranchero 1966-71 1967 Mustang, Cougar, Fairlane Tubular Lower Control Arm part # TBF-6 sold as a pair. Global West offers a tubular lower control arm for the 1967 Ford Mustangs. The tubular arm is stronger then the stock unit and has a replaceable ball joint. Stock control arms do not have a replaceable ball joint. When the ball joint wears out the whole arm must be replaced. Global West uses a ball joint that can be found anywhere in the country, It is not proprietary. The bushing side of the control arm has a spherical bearing installed rather then a rubber or polyurethane bushing. The bearing does not deflect like poly or rubber and does not create a harsh ride. The bearing allows the up and down movement the suspension needs without resistance. Both rubber and poly have resistance. The result using a bearing like ours is better drive-ability, less wonder, greater control through the turns and braking. The bearing is serviceable and can also be found around the country. Note: The lower control arms are stock length and are not adjustable. Adjustable lower arms will upset the bump steer. Stock strut rods can be used or you can upgrade to our adjustable strut rods. The arms are shipped assembled and are powder coated black. For more information, watch the YouTube video above. 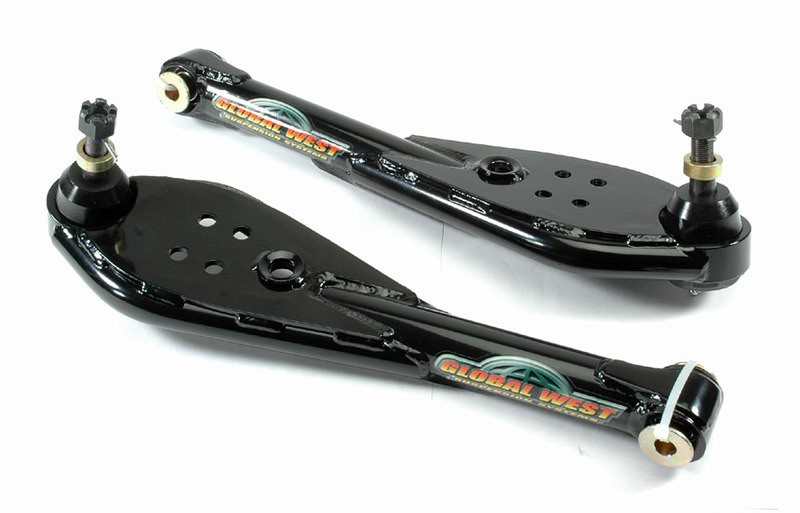 Global West offers a tubular lower control arm for the 1967 Ford Mustangs. The tubular arm is stronger then the stock unit and has a replaceable ball joint. Stock control arms do not have a replaceable ball joint. When the ball joint wears out the whole arm must be replaced. Global West uses a ball joint that can be found anywhere in the country, It is not proprietary. The bushing side of the control arm has a spherical bearing installed rather then a rubber or polyurethane bushing. The bearing does not deflect like poly or rubber and does not create a harsh ride. The bearing allows the up and down movement the suspension needs without resistance. Both rubber and poly have resistance. The result using a bearing like ours is better drive-ability, less wonder, greater control through the turns and braking. The bearing is serviceable and can also be found around the country. Note: The lower control arms are stock length and are not adjustable. Adjustable lower arms will upset the bump steer. Stock strut rods can be used or you can upgrade to our adjustable strut rods. The arms are shipped assembled and are powder coated black. For more information, watch the YouTube video above.